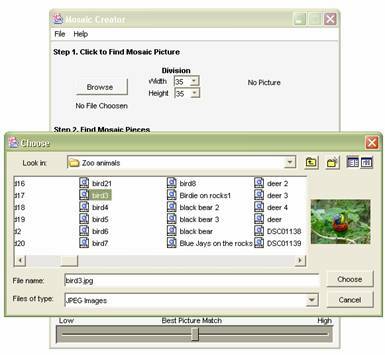 Below is the main window interface.� This is the first thing a user would see when opening up the program.� From this interface the user can find the picture that they want to create a mosaic of, specify the folder where the pieces for the mosaic can be found, and start the creation of the mosaic. When choosing the picture to create the mosaic of, the user will begin under step one. Step one contains a button labeled �Browse� which will open up a browse window (Figure 2 below) which allows the user to find the picture they want to choose.� The only images that can be used by this program have to be in the format of JPEG or GIF. 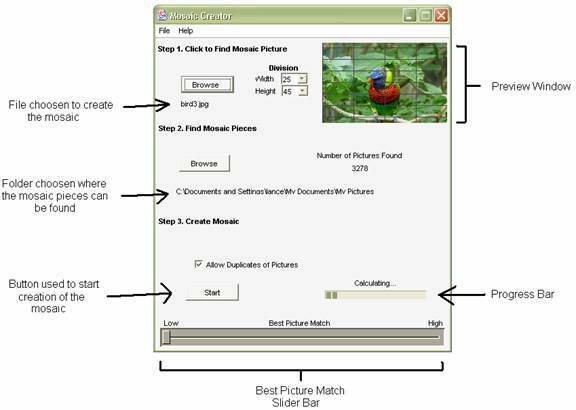 In the preview window, a picture will appear upon clicking the file name once (Figure 2).� To choose the file the user has to either double click on the file or click once on the file and then click the button labeled �Choose� in the bottom right hand side.� After the file has been chosen the browse window will disappear and the program will return to the main window. The divisions in the mosaic specify how many mosaic pieces wide and high are going to be created. By clicking on the drop down box next to either width or height you will be shown a list of selections to choose from. When a selection is made the user can see the relative proportions in the preview window. The mosaic pieces are the sub pictures that are going to create the mosaic.� To choose the picture pieces the user has to select a folder that has all the pictures in it.� The folder selected does not have to have the pictures directly; they can be in any folder or subfolder inside of that folder. 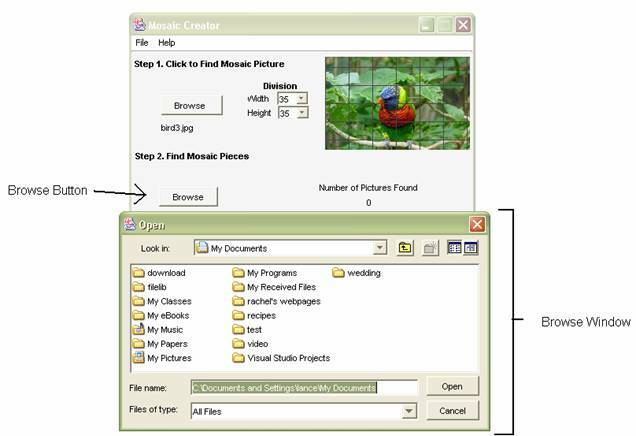 To choose the folder with the mosaic pieces the user has to click the button labeled �Browse� under step 2. When the button is click a browse window will open.� From this browse window the user can find the folder where the mosaic pieces are, click it once, and then click the open button in the lower left portion of the window. The Best Picture Match slider allows the user to choose how close they want the mosaic to match the original picture. If the slider is put all the way to the right, or on high, the process of creating the mosaic will take longer but the mosaic will have a better chance of finding the best piece for each section of the mosaic. If the slider bar is placed to the left, or on low, the mosaic will be created faster but the match might not be the best possible one. At the end of the creation of the mosaic a button labeled �View� will appear which allows the user to view their mosaic. After these steps are done the progress bar will be displayed.� Once the file is read in the view button will appear which allows the user to view their mosaic. 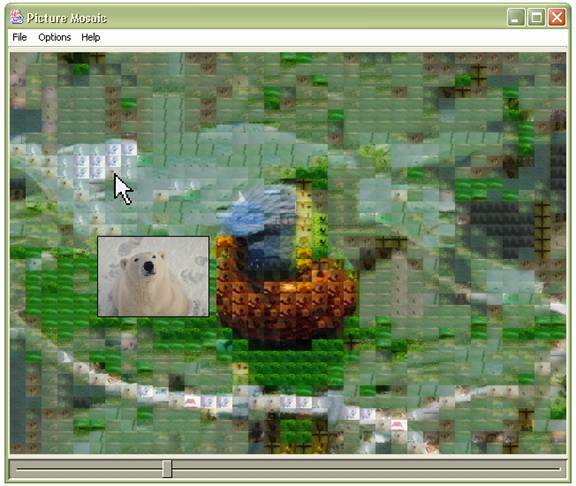 Mouse over viewing allows the user to see the images that create the mosaic.� For example, in Figure 4, the mouse is over an image of a polar bear, and beside the mouse is the enlarged image. The blending slider bar allows the user to create a closer match between the mosaic and the original image.� For example, in Figure 5, the mosaic to the left has not had any blending done to it, where as the one to the right has. 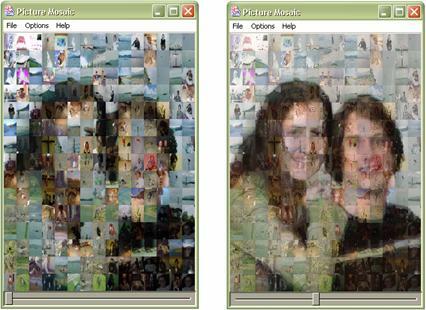 There are two ways a user can save their mosaics, either as a Mosaic or a JPEG.